Note: There might be spoilers in the review. I am really surprised by the reviews. 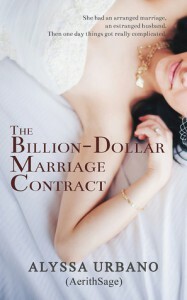 The Billion-Dollar Marriage Contract is the debut novel of Alyssa Urbano, and unfortunately it shows. The writing was not refined. I am no expert in English language but I am pretty sure things were not right in the writing department.There were some grammar mistakes and sometimes the sentence structure didn't seem right. Small things were explained a bit too much which, at times, was irritating. I'll just give you some examples. “The engagement ring belonged to my grandmother. She gave it to my grandfather for him to give their son’s bride when the day came." “At first, no. Which bride in their right mind would want a groom drunk enough to fall asleep at his own wedding?” she teased. Don't even get me started on the story. First of all the story was not original, that can be forgiven since most of the stories these days are not. But the number of clichés cannot and will not be forgiven (I refuse to do so!). The main story was slow to start. The whole change of timeline and POVs was irritating. The 10 year leap came after first 30% of the book, which if you ask me took quite a long time. To top it all, there was nothing likable about the MCs. I didn't even get the groveling I wanted from the Hero *sigh*. Was that too much to ask for?? Personally, this is not a book I'll recommend anyone.